Dragablz Meets MahApps, pt II. | Dragablz Meets MahApps, pt II. Dragablz Meets MahApps, pt II. In a previous post I showed Dragablz and MahApps working together with a few basic pointers. In this post I will illustrate the specific MahApps styles included in Dragablz, and show how to get a basic app shell up and running using both libraries. 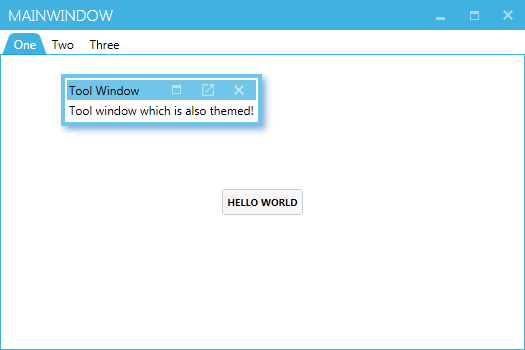 So, starting from scratch, create a new WPF Application in Visual Studio. Throw a TabControl into your app. If you fire it up, you’ll see it looks like tripe. And it’s static. To bring the tab control to life get Dragablz installed. Either from the Package Manager Console or the Manage Nuget Packages dialog install Dragablz. If you fire up the application now you should be able to tear the tabs out. But it most definitely still looks rubbish. We need styles. Again, use your NuGet delivery mechanism of choice to bring in MahApps.Metro. MahApps handy QuickStart guide should popup in Visual Studio. If it doesn’t, check here. Follow the guide. In summary we need to convert our Window to the MetroWindow, and add a include few ResourceDictionary instances in the App.xaml. If you fire up the application you will see the tab control is now coloured according to the MahApps accent defined in the App.xaml. And here will be your final result, a MahApps Window, ready for all your Metro/Modern UI content, which can also support tear-able tabs, tool windows, and docking! In a future post I will illustrate how to add and remove tabs, and work in a MVVM environment. 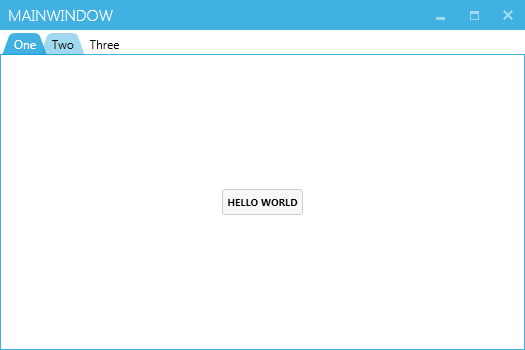 Next postMaterial Design In XAML – Mash Up! Nice, looking forward to part III. Any chance of including an example of adding a usercontrol to the tabcontrol outside of xaml. So far this is the only point it falls down for me :S. Can’t seem to get the content to load in the tab when I add it from a button press etc. Ok. Will try and get something up over the next few days. The rest of the code in the class is using rx / dynamic data (my os project) to manage adding and selecting an item. MdiExample is a UserControl. Thus, a UserControl added via code. Thanks I’ll give it a look.